The distribution of the gains from economic growth has gotten horribly skewed since around 1980, as the graph above shows (using a log scale so that distances on the vertical scale are equal relative changes). Average real incomes of the bottom 90% of households have fallen by 5% in real terms since 1980, while the real incomes of the top 0.01% have grown by 325%. This is astounding. Something has changed for the far worse in recent decades. The real incomes of these groups grew at roughly similar rates in the post-World War II decades leading up to 1980, but then diverged sharply. The purpose of this blog post is to look at concrete policy measures that can be taken to address the problem. The issue is not slow growth: As noted above, per capita growth in GDP since 1980 has been similar to what it was before. The problem, rather, is the distribution of the gains from that growth, which has become terribly skewed. Discussion of this is also timely, as a consensus appears to be forming among political leaders in both major parties that something needs to be done about the stagnant incomes of the poor and middle classes. Several of the candidates seeking the Republican presidential nomination have said they wish to make this a primary issue of the 2016 campaign. This is good. If they are serious, then they would support measures such as those laid out below. I doubt they will, as they were strenuously opposed in the past to many of them, and indeed championed the changes in policy from the Reagan period onwards which are, at a minimum, associated in time with the deterioration in distribution seen in the chart above. But one can hope. This is a long blog post, as it discusses a long list of measures that could be taken to address the predicament of the poor and middle classes. Many (although not all) of these policies have been reviewed in previous posts on this blog. Thus the discussion here will in such cases be kept individually brief, with the reader encouraged to follow the links to the earlier blog posts for more substantive discussion of the points being made. And the reader with limited time may wish to scan through the section headings, and focus on those topics of most interest. We start with the labor market, as it is fundamental. 1) Raise the minimum wage: The minimum wage is now less in real terms than what it was in 1950, during the presidency of Harry Truman. This is amazing. Or perhaps what is amazing is the argument made by some that raising it would price workers out of their jobs. Real GDP per capita is now 3.75 times what it was then, and labor productivity has grown to 3.5 times what it was then. But the minimum wage is now less in real terms than what it was then. The minimum wage in 1950 was not too high to price low paid workers out of the market, and labor productivity is three and a half times higher now. Obama has called for the minimum wage to rise to $10.10 per hour from its current $7.25 per hour (with this then indexed to the rate of inflation). This would bring the minimum wage back only to where it was in the 1960s, a half century ago. There is no evidence that such a rise will hurt low wage workers, and it would still leave a full time worker (at 40 hours a week, and with no vacation time, so 52 weeks per year times 40 hours per week = 2,080 hours per year) at such a minimum wage (2,080 x $10.10 = $21,008 per year) earning well less than what is needed to bring a family of four up to the poverty line ($24,250 per year for a family of four in 2015). This is the minimum that should be done. Indeed, it should be more. 2) Ensure predictable work hours: Many workers, particularly in sectors such as retail and food service (whether fast food or traditional restaurants), are increasingly being required to accept “flexible” work hours, where their employer tells them only a short time ahead what days to come in, at what time to report, and for how many hours. They might be told a few days before, or only the day before, or sometimes only on the day of possible work, whether they will be needed and should report to work. This is sometimes called “just-in-time” scheduling (a term taken from just-in-time inventory management) or “on-call” scheduling, and managers are rewarded for what is seen as “optimizing” their use of labor. But it plays havoc with the life of many workers. They cannot take a second job in the evening to help make ends meet, if they do not know whether their primary job may sometimes require that they come in on short notice to work an evening shift. Students cannot enroll in college classes in order to finish a degree if they do not know whether they might be called in during class time. Parents and especially single mothers can have great difficulty in arranging for child care when their work schedules are unpredictable. And an unpredictable number of weekly work hours, of perhaps 30 hours one week and 20 hours the next, makes budgeting impossible. Recent developments in computer and communications technology have made on-call scheduling possible and increasingly common. Establishments such as Starbucks can receive at some central office real-time information on coffee sales (from the cash registers, via an Internet connection), and together with other factors (weather forecasts; whether a convention is in town) can run sophisticated software algorithms predicting how many workers will be needed, exactly when, and which ones should be called in. The problems this creates for low income workers has only recently come to be recognized. An important spark was a story in the New York Times on August 13, 2014, on the impact on a worker at Starbucks. This led Starbucks the very next day to announce it would change its practices, but a review a month later by another news organization raised questions as to whether anything of significance had really changed. Starbucks can possibly be shamed into improving it working conditions, as it sells high-end coffee to those with significant disposable income. And if the problem were solely with Starbucks and a few similar firms, a shaming approach might possibly be effective. However, while Starbucks may have become the symbol, the practice has unfortunately become increasingly widespread. Furthermore, there is competitive pressure across firms to adopt such practices. If Starbucks stops the practice, it may face coffee retailers who continue to “optimize” their use of labor through such practices, who can then take away business by charging less. There is thus pressure on firms to impose the lowest standards they can get away with. There is no federal law against such labor practices. There may be state laws which might constrain the practices in some way in certain jurisdictions, but they are not widespread. What is needed is a legislated solution which will apply generally, and should be undertaken at the federal level. This has been done before. Abuses of labor had become common during the “gilded age” of the late 1800s / early 1900s (when income distribution was, not coincidentally, as bad as it is now). Progressive Era and later New Deal reforms addressed some of the more egregious issues. Work place safety and child labor laws were enacted, a minimum wage was established, and a 40 hour work week was set as the standard, where a worker is required to be paid overtime at the rate of “time and a half” (150% of their regular wage) for any hours worked beyond 40 in a week. The issue of unpredictable work hours could be addressed similarly. All workers would have a normal set of hours, defined individually and a function of their particular job. They would always be paid for this set of normal hours. But it is recognized that firms may have an unexpected need for additional workers at certain times (for example to substitute for a worker who is sick). Workers could take on such additional shifts beyond their regular hours if they so chose, but as a financial inducement for the firm not to rely on such job calls, the firm would be required to pay 150% of normal wages for such time (as for overtime work). This would lead firms to assess better when they need workers and when not, and build this into the standard work schedules. Firms have little incentive to do this now, since the cost of unpredictable schedules is shifted onto the workers. Note also that with this system there will not be an incentive to further split up jobs, as all workers will be assigned an individualized normal schedule. The firms will gain no flexibility by splitting a 30 hour a week job into one of 20 hours and one of 10 hours. They will still need to determine when workers are expected to be needed, in order to assign hours accordingly. And to the extent they do not do this carefully, they will be penalized as they will then need to pay 150% of the wage when a worker needs to be brought in to cover those extra hours. Predictability in hours is extremely important to low wage workers. Indeed, it is quite possibly more important than raising the minimum wage. It will shift some of the costs of unpredictability back onto the firm, where it had been until modern computer and communications technology (and lax labor laws that did not foresee this) allowed the firms to shift onto workers the cost of unpredictability. Firms did this to raise profits, and business profits did indeed then rise while wage earnings stagnated. This is precisely the issue that needs to be corrected. 3) Manage policies to return the economy rapidly back to full employment when there are economic downturns: While it would be ideal always to keep the economy at or close to full employment, economic downturns happen, most recently in 2008 in the last year of the Bush administration. But when they do, the priority should be to return the economy to full employment as rapidly as possible. Everyone can of course agree on this. Differences arise, however, on how to do it. Monetary policy should be used to the extent possible, but there is a limit to how much it can do since interest rates cannot go below zero. And they have been at essentially zero since late 2008, following the Lehman Brothers collapse. The Fed can also try to reduce long term rates (such as through quantitative easing), and while its policy here has had some beneficial effect, it is also limited. Monetary policy in a downturn such as that just experienced must therefore be supported also by expansionary fiscal policy. Additional government spending is the most effective way to expand demand, as it does this directly. Tax cuts can also help, but are less effective since a significant share of the reduction in taxes may be partly saved by households (and likely will be largely saved by higher income households). There will thus be less stimulative effect per dollar from tax cuts than from direct spending. Unfortunately, government spending was cut each year from 2010 up to 2014. This was the first time in at least 40 years that government has cut spending in a downturn. Hence the economic recovery has been the slowest of any over that period, and only picked up in 2014, when government spending was finally allowed to increase. Republicans have argued that to return the economy to full employment, one should instead reduce regulations. But this makes no sense. Regulations in the middle of a downturn are not far different from what they were before the downturn began, so how can they be blamed for the unemployment, and how would reducing them lead to less unemployment? And if some regulations are wrong, one should change them, whether the economy has high unemployment or low unemployment. Regulations do not serve as a macro policy to reduce unemployment, but rather serve a micro purpose to ensure the economy functions efficiently. 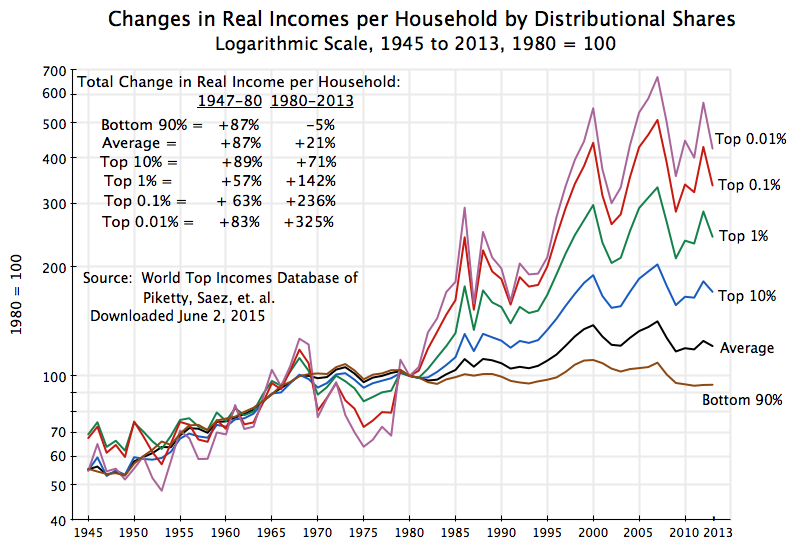 A slack labor market will have a direct effect on income inequality. When there is available labor that is unemployed, a laborer will have little leverage to negotiate for higher wages. And unemployment has been higher, on average, in the three decades following 1980 than in the three decades before 1980. A simple regression analysis suggests that if the average rate of unemployment after 1980 had simply matched what it had been before 1980, then the real incomes of the bottom 20% of households would not only have grown at a rate similar to how fast they had grown before, but also at a rate similar to that of the top 20% in the period after 1980. That is, there would have been continued growth in the real incomes of the bottom 20% after 1980, instead of stagnation, and no increase in inequality relative to the top 20%. Keeping the economy at close to full employment is critical to the poor and middle classes. Fiscal policy is therefore an important instrument to keep the economy at full employment, or to return it to full employment from a downturn. What specifically should be done? 1) End the Congressional budgetary “pay-as-you-go” rules when in or recovering from a recession: The Budget Enforcement Act of 1990 required that, as a budgetary rule, any increase in mandatory government spending or reductions in taxes must be “paid for” over the next five years as well as the next ten years by offsetting spending cuts or tax increases, so as to be budget neutral over these periods. While the rules have been modified over the years, were not in place for a period during the Bush II administration, and were not always abided by (such as for the large tax cuts at the start of the Bush administration), they have acted in recent years to limit the government spending that was needed to recover from the downturn. Over the course of a full business cycle, covering the full period over when the economy is at or close to full employment and when it is not, a limit on the size of the government deficit is warranted. But by setting such a limit to apply identically and continuously both in a downturn and when the economy is booming, one limits the government expenditures that may be needed for a rapid recovery. The rule should be suspended during any period when the economy is in a recession or recovering from one, to be replaced by a rule that applies over the course of the business cycle as a whole and which focusses on the government debt to GDP ratio rather than simply the government deficit. As unemployment rose and incomes fell, especially of the poor and near poor, many more households became eligible for food stamps and, having lost jobs, for unemployment insurance. Expenditures on these and other safety net programs expanded, as they are designed to do in a downturn. But Congressional Republicans then forced through cuts in the key safety net programs (e.g. unemployment insurance, and food stamps) by limiting eligibility, and have sought much more extensive cuts. If one wishes to help the poor and near poor, one does not cut programs which help them directly, and especially not when they most need them. These programs are also extremely efficient. The food stamp program (SNAP) spends only 5% of its budget on administrative costs. Few charities are anywhere close to as efficient, but at least some prominent Republicans think otherwise. Former Congresswoman Michele Bachmann, at one point the leading contender for the Republican presidential nomination in 2012, asserted that 70% of food stamp funding went to “bureaucrats”. This was absurdly wrong. Safety net programs in the US, while efficient for the money spent, are however highly limited in how much they do spend. US income inequality or poverty rates are actually not worse than those seen in other high income OECD economies in terms of wages and other income paid to workers. That is, the US capitalist market economy does not itself produce more unequal outcomes than those of other high income OECD economies. The US is near the average in this across all the OECD countries. But once one takes into account government taxes and transfers, the US turns out to be the very worst, both in terms of inequality (as measured by the Gini coefficient) and in terms of poverty (by the share of the population considered poor). The problem is not that the US tax and transfer programs are not especially progressive: They are in fact more progressive than in most countries. The problem is that they are simply too small to matter. 3) Implement a public infrastructure investment program: American public infrastructure is an embarrassment. Compared to other high income countries, US roads, bridges, mass transit, and other public structures, are clearly inadequate in scale, are in terrible condition due to inadequate maintenance, and constitute what is in effect a growing debt that will need to be repaid in the future when they finally have to be rebuilt (normally at much greater cost than if they had been maintained properly). Public investment has been cut back especially sharply in recent years, whether measured as a share of GDP or simply in real per capita terms, as a consequence of Congressional cuts in the budget. But while the cuts have been especially sharp since 2010, the problem is long-standing. Amazingly, US non-defense public investment in structures in 2013 was less, in real per capita terms, than what it was in 1960, even though real per capita GDP almost tripled over this period. It should therefore be no surprise that roads and bridges are in poor condition (with some bridges that have even collapsed), mass transit systems are in poor repair, and all are grossly inadequate to what we need. This impacts especially the middle classes, who have to sit in traffic jams daily just to get to work. Toll roads or tolled lanes built by private concessionaires have become fashionable in recent years to build roads that government is no longer willing to pay for, but they can be expensive. The tolled lanes opened recently in Northern Virginia in the I95/I495 corridor have tolls that, for the entire length, could conceivably reach $40 or more per trip (and double that per day). Rich people can afford this, but most of those with middle class incomes cannot. Adequate public infrastructure is needed to raise productivity and for the economy to grow. And the recent severe downturn should have been a time for a special effort to expand such investment, putting to work unemployed construction and other workers, in firms that had capacity to produce more than they could sell due to low demand in the downturn. Furthermore, the government could have borrowed long term funds during this period at historically low rates, and even at times at negative real rates. It was insanity not to utilize the unemployed labor and underutilized firms, financed by funds at low or even negative real cost, to build and repair infrastructure that the economy and especially the poor and middle classes desperately need. But this was not done. It instead will need to be done over the coming years (and at much higher cost, due to the lack of maintenance), when the economy is hopefully at full employment, interest rates have returned to normal levels, and anything extra spent on public infrastructure will need to come out of less being available for other goods and services, including for private investment. 4) Increase public support to higher education: At one time, students could pay for the total costs of attending a state university, including room and board, through work at just the minimum wage during summers and part time during the academic terms. This is no longer the case. In part this is due to the fall in the minimum wage in real terms from where it had been in the 1960s. But it was also a consequence of the rising cost of university education (a result of Baumol’s cost disease) coupled with sharp cutbacks in the share of these costs covered by state support to their colleges and universities, shifting more of the cost onto students and their families. This reduction in state support to their colleges and universities needs to be reversed, or soon state schools will in effect no longer exist. They will have become essentially private schools catering to those who can afford them. And while federal programs exist to help students (most importantly the Pell Grant program, which provides grants of up to $5,775 per year, in academic year 2015/16), they are limited and family income based. The maximum Pell Grant goes only to the poorest households. There are different ways to assist students from poor and middle class households to continue their schooling beyond high school. President Obama, in this year’s State of the Union address, proposed for example that federal support be provided so that community colleges would stop charging tuition for students in good standing. One would in essence be extending the availability of public schooling from 12 years now to 14 years. The budget cost would be relatively modest at just $6 billion per year. Others have suggested, constructively, that using such funds to expand the Pell Grant program would achieve the same aim, while assisting also those low income and middle class students who would do better by enrolling in a four-year college. The response of the Republicans in Congress has, however, been in the opposite direction. While rejecting Obama’s proposal for community colleges, the recent proposal from the House Budget Committee would instead freeze the maximum Pell Grant at $5,775 for at least the next ten years, thus leading to its erosion in real terms as prices rise (much as the minimum wage has eroded over time due to inflation). Tax policy has a direct impact on income distribution. But while most still accept the principle that taxes should be progressive (the principle that the rich should pay taxes at a higher rate than the poor), the tax system the US in fact has is regressive in many of its aspects. 1) Stop the preferential tax treatment of income from wealth: The wealthy pay a lower rate of taxes on their income from wealth than most of the population pays on their income from labor. In terms of policy options to address inequality, little would be more straightforward than to end the practice of taxing income from wealth at lower rates than income from work. Tax rates on all income groups could then be reduced, with the same total tax revenues collected. The long-term capital gains tax rate on most assets is only 15% for most earners (there is an additional 3.8% for those households earning more than $250,000 bringing the rate to 18.8%, with this rising by a further 5% points to 23.8% for those earning $464,850 or more in 2015). These rates on income from wealth are well below what is paid by most on income from labor (wages). While the regular income tax rates (on wages) vary formally from 10% in the lowest bracket to 39.6% in the highest, one should add to these the social insurance taxes due. These are often referred to loosely as Social Security taxes, but they include both Social Security at a 12.4% rate (up to a ceiling in 2015 of $118,500), and Medicare taxes at a 2.9% rate (with no ceiling). Note also that while formally the employee pays half of this and the employer pays half, analysts agree that all of the tax really comes out of wages. Once one includes social insurance taxes on wages, the effective tax rates on income from labor goes from 25.3% for the lowest bracket to 40.3% on those earning between $74,900 and $118,500, after which it drops down to 27.9% as the Social Security ceiling has been hit, and then starts to rise again. The long-term capital gains rate is always below this even for the very richest, and normally far below. To add further complication, preferential rates of 25% apply to long-term capital gains on certain commercial building assets (“Unrecaptured Section 1250” gains), and 28% apply to collectibles (such as fine art or gold coins) and certain small business stock. These are still well below what most pay in taxes on income from work. This system not only worsens income inequality, but also creates complications and introduces distortions. Many of those with high income are able to shift the categorization of their incomes from what for others would be wage income, to income which is treated as long-term capital gains. Properly structured stock options, for example, allow CEOs and other senior managers to shift income from what would otherwise be taxed at ordinary income tax rates to the low rates for capital gains. “Carried interest” does the same for fund managers. With many fund managers earning over $100 million in a year, and indeed some earning over $1 billion, this preferential tax treatment of such extremely high earnings is perverse. The reform would be simple. All forms of income, whether from labor or from wealth, would be taxed at the same progressive rates that rise with total household income. The one issue, which can be easily addressed, is that income from long-term capital gains should be adjusted for inflation, to put the gains all in terms of current year prices. But this can easily be done by scaling up the cost basis based on the change in the general price level between when the asset was bought and when it was sold. The IRS could supply a simple table for this. 2) Reduce marginal effective tax rates on the poor: Conservatives have long argued for cuts in marginal tax rates for the rich, arguing this would lead to faster growth (“supply-side economics”). While there is no evidence that lower tax rates in recent decades have in fact led to faster growth, this was the stated rationale for the big tax cuts under Reagan and then Bush II. Liberals have noted that if one were really concerned about high marginal tax rates, you would look at the high marginal effective tax rates being paid at the other end of the income scale – by the poor and those of moderate income. Studies have found that these can range as high as 80 or even 100%. The marginal effective tax rates take into account the impact of means-tested programs being phased out as one’s income rises. When extra income is earned, you will pay not only a portion of this in taxes, but you will also lose a portion of benefits that are being provided (such as food stamps) in programs that phase out as income grows. If the extra paid in taxes plus the amount lost in benefits matches additional earnings, the marginal effective tax rate will be 100%. Conservatives have started to pay attention to this. An opinion column in the Wall Street Journal last September by Senators Marco Rubio and Mike Lee (both Tea Party favorites) decried the 80 to 100% marginal effective tax rates that low income workers might face, arguing this can act as a strong disincentive to work. In reality, the rates being faced by the poor are normally less, although still substantial. The issue is complex since the effective tax paid will depend not only on income, but on such factors as: 1) Family composition (whether married and number and age of children); 2) Where one lives (what state and often what city or county); 3) Particular benefit program qualification criteria (which will vary by program, and will often depend on many factors other than income); and 4) Whether the individual always enrolls in programs they are qualified for, as one may not be aware of certain benefit programs, or find the benefits to be too small to be worthwhile (because of difficulties and complications in enrolling, with these quite possibly deliberate difficulties in some jurisdictions). The Congressional Budget Office, in a careful study issued in November 2012, concluded that the marginal effective tax rate for citizens with incomes of up to 450% of the federal poverty line averaged about 30% in 2012. And under law as then in effect, this would rise to 32% in 2013 and 35% in 2014. There was a good deal of variation within the average, with a marginal effective tax rate of as much as 95% (for example, for single mothers with one child with an income in the range of about $18,000 to $20,000, which was just above the poverty line for such a household). But rates of 40% or more were not uncommon. Such rates, even when not at the 80 to 100% extremes cited by Senators Rubio and Lee, are high. Even at just 30% (the average) they are double what those who are far better off pay in long-term capital taxes. While the conservative senators argue that such high marginal rates discourage work effort (there is in fact little evidence that this is the case – when you are poor, you are desperate for whatever you can get), such high marginal rates are in any case unfair. If one wants to help those of low and moderate income, these effective tax rates should be reduced. There are three ways, and only three ways, to reduce the marginal effective tax rates on the poor. One is to get rid of the benefit programs for the poor altogether. If they receive no food stamps to begin with, one has nothing to lose when incomes rise. But this then penalizes the poor directly. One could also phase out the programs more slowly, and pay for this by reducing the benefits to the poorest. This is then a transfer from the poorest to the somewhat better off than the poorest. Senators Rubio and Lee proposed this route (without explicitly calling it that) by reducing benefits such as food stamps and providing instead larger child tax credits for all households (including the rich). This would be a transfer from the poorest to those of higher income (including the rich), and especially to those with large families. The poorest would be penalized. Finally, the third and only remaining option is to phase out the benefit programs more slowly. This reduces the marginal effective tax rate that poor households will face if they are able to obtain jobs paying more than what they earned before. It will not penalize the poorest, but it does of course require that budgets for the programs then rise. But this will be support made available directly to the poor, and in particular to the working poor (as they are the ones facing the high marginal effective tax rates from additional earnings). If one is concerned about poverty and inequality, this is precisely the support that should be provided. 3) Tax inherited wealth the same as any other wealth: Wealth that is inherited enjoys significant tax benefits. The only exception is wealth that is so large that it becomes subject to the estate tax (greater than $10.86 million for a married couple in 2015). But few pay this due to that high ceiling, as well as since one can establish trusts and use other legal mechanisms to avoid the tax. Indeed, in 2013 (the most recent year with available data), estate taxes were due on less than 0.2% of estates; the other 99.8% had no such taxes due. This is down from over 6% of estates in the mid-1970s, due to repeated changes in tax law which narrowed and reduced further and further what would be due. Any wealth that is passed along within the effective $10.86 million ceiling will never be subject to tax on capital gains made up to the point it was passed along. That is, the cost basis is “stepped-up” to the value upon the date of death. If one had purchased $100,000 of General Electric stock 40 years ago, the stepped-up value now would be roughly $3 million, and no taxes would ever be due on that $2.9 million of gain. This is not fair. Taxes on such wealth should be treated like taxes on any other wealth, and as argued in item #1 of this section above, all sources of income should be taxed the same (recognizing, importantly, that capital gains should be adjusted for inflation). Some have argued that this cannot be done for inherited wealth since those inheriting the wealth may not know what the original cost basis was. But this is not a valid excuse. First of all, the two most important categories of wealth that are passed along through estates are homes and other real estate, and stocks and bonds and other such traded financial assets. There are government land records on all real estate transactions, so it is easy (and indeed a matter of public record that anyone can look up) to find the purchase price of a home or other real estate. And purchases of stocks, bonds, and other trade financial assets are done via a brokerage, which will have such records. Second, if there are any other assets with special value (such as valuable coins or works of art) that will be passed along through an estate, the owner of those assets can include a record of their cost basis as part of the will or trust document that grants the asset to those inheriting the estate. 4) Equal tax benefits for deductions should be provided for all income levels: Under the current tax system, if a rich person in a 40% marginal income tax bracket makes a $100 contribution to some charity, then the government provides a gift to that rich person of $40 through the tax system, so that the net cost will only be $60. If a middle class person in a 20% marginal tax bracket makes a $100 gift to the exact same charity, then the government will pay them back $20, for a net cost of $80. And if a poor person in the 10% bracket makes a $100 gift to that same charity, the net cost to him will be $90. This is enormously unfair. There is no reason why deductions should be made more valuable to a rich person than to a poor person. And there is an easy way to remedy it. Instead to treating deductions as subtractions from taxable income, one could take some percentage of deductions (say 20%) as a subtraction from taxes that would otherwise be due. The $100 gift to the charity would then cost the rich person, the middle class person, and the poor person, the same $80 for each. 5) Set tax rates progressively, and at the rates needed to ensure a prudent fiscal balance over the course of the business cycle: I have argued above that all forms of income should be taxed similarly. Whether you earn income from working or from wealth, two households with the same total income should pay taxes at the same rates. This is not only for fairness. It would also simplify the system dramatically. And this is not only for the obvious reason that calculations are easier with one set of rates, but also because the current diverse rates interact between themselves in complex ways, which make computing taxes due a headache when there are different rates for different types of income. Perhaps most importantly, it would eliminate the incentive to shift income from one category to another (e.g. from wage income to stock options) where lower taxes are due. That creates distortions and wastes resources that should be used for productive activities. There remains the question of what the new rates should be. I do not have the data or the detailed tax models which would allow one to work that out, but a few points can be made. One is that the new tax rates would be lower (at any given level of income) than what regular income tax rates (on wage income) are now. This is because the tax rates on income from wealth (such as for capital gains, or inherited wealth) would be unified with the now higher tax rates on income from labor, so the new overall tax rates on regular income can be lower than before to yield the same level of tax revenues. General income tax rates would come down. Second, one should of course preserve the principle of progressivity in the tax code. Rich people should pay taxes at a higher rate than poor people. As Warren Buffitt argued eloquently in a New York Times column in 2011 (“Stop Coddling the Super-Rich”), there is no economic justification for the rich to pay taxes at lower rates than those with less income. And it is grossly unfair as well. Their secretaries should not pay at higher rates than the rich (fully legally) pay. Third, one needs to recognize that the purpose of taxes is to raise revenues, and rates should thus be set at the levels required to cover government expenditures over time. As argued above, the budgetary accounts should not be forced to balance each and every year, since fiscal policy is extremely important to move the economy back to full employment in an economic downturn (and fiscal policy is basically all that is available when interest rates are at the zero lower bound, as they have been since late 2008 in the US). But over the full course of the business cycle, tax rates should be set so that the tax revenues collected suffice to keep the government debt to GDP ratio at a stable and reasonable level. This implies deficits when unemployment is high, and surpluses when the economy is close to full employment. The economy was at full employment in 2006-07 (unsustainably so due to the housing bubble building up in those years) with the unemployment rate below 5% and as low as 4.4%. Unfortunately, due to the Bush II tax cuts, the government’s fiscal deficit in those years was still significant. Applying these principles, the tax rates needed for this would need to be worked out. This can be done, but I do not myself have access to the data that would be required. In the end, I suspect that regular income tax rates could be reduced substantially from what they are now, with this still sufficient to provide for adequate government expenditures over the course of the business cycle. But the rich would pay more while those of low to moderate income would pay less, and whether this would then be possible politically is of course a different issue. Access to health insurance is important. A careful statistical analysis published in 2009 found that the likelihood of dying is higher for the uninsured than for the insured, and the lack of universal health insurance (as was then the case in the US) was leading to an estimated 45,000 more Americans dying each year than would be the case if they had health insurance. This is greater than the number of Americans killed in action over the entire period of the Vietnam War. The ObamaCare reforms have been a big step forward to making it possible for all Americans to obtain access to health care, but it remains under threat. If Republicans are serious about helping the poor and middle classes, they should support the following. 1) First, stop trying to block health care access for all: ObamaCare, while not perfect (it reflects political compromises, and is based on the system of individual mandates first proposed by the conservative Heritage Foundation in 1989), is nonetheless working. An estimated 16.4 million Americans now have health insurance coverage, which they did not have before ObamaCare became available. And a Gallup poll found that there was a higher satisfaction rate among those obtaining health insurance policies through the ObamaCare exchanges, than among those with traditional health insurance policies (mostly via employers). Despite this, Republicans continue to campaign aggressively to terminate ObamaCare, and have supported lawsuits in the courts to try to end this health care access. A case now before the Supreme Court, with findings to be announced this month (June 2015), may declare that the federal government payments made through certain of the ObamaCare exchanges (those not run by the states) to those of low to moderate income, cannot be continued. If the Supreme Court finds in favor of those opposed to such payments, these low and moderate income households will no longer be able to obtain affordable health insurance. If the Republican presidential candidates are in fact in favor of helping the poor and middle classes, they should call for an end to the continued efforts by their Republican colleagues to terminate ObamaCare. There are ways it could be improved (e.g. by taking more aggressive actions to bring down the cost of medical care to all in the US), but it is working as intended, and indeed better than even its advocates expected. 2) Extend Medicaid in all states in the US: The ObamaCare reforms built on the system of existing health insurance coverage. Medicare would remain the same for those over age 65; employees in firms would normally pay for health insurance coverage through employer based plans; Medicaid would expand from covering (generally) those up to the poverty line to include also those with income up to 133% of the poverty line; and all those remaining without health insurance would be allowed to purchase coverage from private health insurers competing on internet-based health insurance exchanges, where those with incomes of up to 400% of the poverty line would receive federal subsidies to make such health insurance affordable. The Medicaid expansion to cover all those with incomes of up to 133% of the poverty line was thus one of the building blocks in the ObamaCare reforms to enable all Americans to obtain access to affordable health care. Because of its historical origins in health care programs for the poor that had traditionally been implemented in the states, Medicaid is implemented at the state level even though it is funded jointly with the federal government. For the Medicaid expansion to 133% of the poverty line, the federal government through the legislation setting up ObamaCare committed to funding 100% of the incremental costs in the first three years (2014 to 2016) with this then phased down to 90% in 2020 and thereafter. Despite this generous federal funding, the Supreme Court decided in 2012, in its decision that also found ObamaCare in general to be constitutional, that Congress could not force the states to expand Medicaid to the higher income limits. Thus the expansion became optional for the states, and as of April 2015, 21 states have decided not to. The 21 states are mostly in the south or the mountain west, with Republican legislatures and/or Republican governors or mostly both. Blocking this Medicaid expansion in these states is being done even though an expansion would cost little or nothing. There is literally no state cost in the first three years as the federal government would cover 100% of the extra costs. And while the federal share would fall then to a still high 90% for 2020 and thereafter, allowing more of the poor to be covered by Medicaid will reduce state costs. The poor in this gap in coverage are forced to resort to expensive emergency room care, for which they cannot pay, when their health gets so bad that it cannot be ignored. These costs are then partially compensated by the state. A careful analysis for Virginia, undertaken for the state by Price Waterhouse Coopers, concluded that if Virginia opted in to the Medicaid expansion, the state would save $601 million in state budget costs over the period 2014 to 2022. And this did not even include the indirect benefits to the budget from higher tax revenues, as a consequence of the additional jobs that would be created (nurses and other care providers, etc.) and the higher incomes of hospitals from less uncompensated care. Denying affordable health care to the poor with incomes of between 100% and 133% of the poverty line is callous. These are the working poor, and there really is no excuse. 3) Ensure employers pay a proportionate share for health insurance for their part-time workers: Employers have traditionally not allowed part time employees to obtain (through their wage compensation package) health insurance cover in employer-based plans. There was a practical reason for this, as health insurance plans only provided cover in full. It has been difficult to provide partial plans, so part time workers have traditionally gotten nothing. This has now changed with the introduction of the ObamaCare health insurance market exchanges. Those without health insurance coverage through their employers can now purchase a health insurance plan directly. One could therefore now require that all employers make a proportionate contribution to the cost of the health insurance plans for their part time workers. That is, for someone working half time (20 hours a week normally) the employer would contribute half of what that employer pays for the health insurance plans for their full time workers. There would then be no incentive (and competitive advantage) for an employer to split a full time job with health insurance benefits into two half time jobs with no health insurance benefits for either worker. Under the current system of normally no health insurance benefits for part time workers, employer are in essence shifting the cost of health insurance fully onto the worker and onto the federal government (and hence general taxpayer) if the worker earns so little that they are eligible for federal government subsidies to purchase health insurance on the exchanges. The proportional employer contribution would be paid to the “account” of the worker in the same way (and at the same time) as Social Security and Medicare taxes are paid for the worker. The funds from this account would then be used to cover part of the costs of the worker purchasing health insurance on the ObamaCare exchanges. And if the worker was working in two (and sometimes three or more) part time jobs in order to make ends meet, the total paid in from all of the worker’s employers might well suffice to cover the cost of the health insurance plan in full. 4) Allow competition from low cost public health insurance: As part of the political compromises necessary to get ObamaCare passed in the face of steadfast Republican opposition, only private health insurers are allowed to participate in the ObamaCare health insurance exchanges. Yet Medicare, which provides health insurance to all Americans age 65 and older, is far more efficient than private health insurance providers. Giving Americans the option (not a requirement) to purchase Medicare administered health insurance on the ObamaCare exchanges would introduce much needed competition. There are often only a few insurers competing in the exchanges, which are all state-based (3 or fewer insurers in 15 of the 51 states plus Washington, DC, with only one insurer offering policies in West Virginia). But even with multiple insurers competing on the state exchanges, the private insurers in general have high costs. Private health insurers nationwide (and for all the policies they offer) have administrative costs plus profits equal to 14.0% of the health insurance benefits they pay out. This is huge. The same figure for Medicare is only 2.1%. Medicare costs only one-seventh as much to administer as private health insurance. And note these lower costs are not coming out of low payments to doctors and hospitals since the 14.0% and 2.1% are being measured relative to claims paid. It would be straightforward to allow Medicare to compete on the health insurance exchanges. One would require that Medicare charge rates sufficient (for the resulting client base, which will of course be younger than and generally healthier than Medicare’s senior citizens) to recover its full costs for such coverage. But Medicare could use its existing administrative structure, including computer systems and contracts with doctors, hospitals, and other medical care providers at the rates that have already been negotiated. Purchasing a Medicare administered health insurance policy on the exchanges would be fully optional. No one participating in the exchanges would be required to buy it. But with its lower costs, the competition Medicare would introduce into the exchanges could be highly effective in bringing down costs. Probably the greatest failure of any social experiment of recent decades has been the switch of employer pension plans from the traditional defined benefit plans that were common up to the early 1980s, to defined contribution schemes (such as 401(k) plans) that have grown to dominance since the 1980s. In doing this, employers not only shifted the investment, actuarial, and other risks on to the individual workers, but also typically reduced their matching funding shares significantly. The end result is that workers are now typically woefully unprepared for retirement. The funds accumulated in their 401(k) and IRA accounts for households (with head of household aged 55 to 64) with a 401(k) account, only amounted to $111,000 in 2013 (for the median household). Such an accumulation, for households who will soon be in retirement, would suffice to provide only less than $400 a month by the traditional formulas, or $4,800 per year. This is woefully inadequate, and these households will need to rely on what they can get from Social Security. But Social Security payments are also not much. For 2012 (the most recent year with such data), the median Social Security pension payment per beneficiary (age 65 or more) was just $16,799 per year, or per family unit (with head aged 65 or more) just $19,222 per year. Furthermore, if nothing is done, the Social Security Trust Fund will run down to a zero balance in 2033 based on the most recent projections. Fully funding Social Security is eminently solvable, as will be discussed below. The annual cost (including for disability insurance) will rise from roughly 5% of GDP currently to 6% of GDP in 2030, as the baby boomers retire, or an increase of just 1% of GDP. But what many do not realize is that on current projections, Social Security expenditures are then expected to remain stable (under current benefit rules) at that 6% of GDP for the foreseeable future, in projections that go out 75 years. One can find 1% of GDP to save Social Security. But the politicians in Washington will need to agree to do so. 1) Raise, and certainly do not reduce, Social Security payments to those of low and modest income: Social Security payments, while a crucial safety net, are low. As noted above, the median payments in 2012 for those aged 65 and older were just $16,799 per beneficiary and $19,222 per recipient family (for the old age component). Such payments are minimal. Yet these are just medians, meaning half of all recipients received less than even those figures. Despite being so low, these Social Security payments are critical to many Americans. For the entire population of those aged 65 and older, Social Security accounted for half or more of their total regular income for two-thirds of the population (65% to be precise); Social Security accounted for 90% or more of their income for over a third of the population (36%); and Social Security accounted for 100% of their income for a quarter of the population (24%). This is incredible, and shows the failure of the current pension systems in the US to provide a reasonable income in retirement for American workers. The situation is, not surprisingly, worse for those of low to moderate income. For the bottom 40% of the population by income, where 40% is by far not a small or insignificant share, Social Security accounted for half or more of their regular total income for 95% of them. Social Security accounted for 90% or more of their income for three-quarters (74%) of them, and for 100% of their income for over half of them (53%). Social Security benefits are by no means large. Yet a large share of Americans depend on them. They should not be cut, but rather should be raised, at least for those of low to moderate income who are critically dependent on them in their old age. 2) Broaden the base for Social Security taxes to ensure the system remains fully funded: As noted above, the Social Security Trust Fund will be depleted in 2033 (based on current projections, and including the disability component – while technically separate, the trust funds for old age and for disability insurance are normally treated together). While some argue, with some justification, that the Trust Fund is fundamentally just an accounting tool, which can be “topped-up” with regular federal government transfers if necessary, there are also good reasons to stay with the Trust Fund rules. They help keep the Social Security system out of routine Washington politics, and the temptation by conservatives to cut Social Security benefits in order to reduce the size of government. Under the current Trust Fund rules, participation in the Social Security system is mandatory; taxes are paid on wage earnings (up to a ceiling of $118,500 in 2015); at a rate of 12.4% for Social Security pension and disability coverage for the employer and employee combined (excluding the 2.9% with no wage ceiling for Medicare); and upon retirement, these contributors will receive regular monthly payments from Social Security until they die, based on a formula which is linked to how much was paid into the Social Security Trust Fund during their working career (for the 35 years of highest inflation adjusted earnings). The formula is complex, and “tilted” in the sense that those earning less will receive back somewhat more than they paid in, while those earning in the upper end of the taxable range will receive back somewhat less. There is therefore some progressivity, but the degree of progressivity is limited. Finally, the taxes paid into the fund will earn interest at the rate of the long-term Treasury bond yield of the time, so the taxes paid in to the fund grow over time with interest. Based on these Trust Fund rules and on current projections of growth in worker earnings (and its distribution) and of what pay-outs will be as workers retire, the Trust Fund is expected to be depleted in 2033. The basic cause is not that Social Security administration is inefficient and wasting funds. It is, in fact, incredibly efficient, with a cost of administration of just 0.5% of benefits paid out (on the old age component). Note this is not on assets, but on benefits paid. As will be discussed further below, the typical expenses on savings in 401(k) and similar accounts will be 2 to 3% of assets each and every year. The principal cause of the Trust Fund being depleted, rather, is that life expectancies have lengthened, and hence the period over which Social Security old-age payments are made have grown. Crudely (and ignoring interest for this simple example), if life expectancy at age of retirement has grown by 50%, so that the number of years during which one will draw Social Security payments has grown by 50%, then the amount needed to be paid in to the Trust Fund to cover this lengthened life will need to grow by 50%. Longer life expectancies are good. The Social Security Trust Fund will run out of assets in 2033 not because the funds are being wasted (as noted above, administrative costs are incredibly low), but because people are living longer. But this will need to be paid for. But it is also critically important to recognize who is living longer. As incomes have stagnated for those other than the rich since Reagan took office (see the chart at the top of this post), life expectancies for the poor and middle classes have in fact not increased substantially. Rather, the overall life expectancy is rising principally because those at higher income levels are enjoying much longer life expectancies (in part precisely because their incomes have been growing so fast). Specifically, life expectancy for a man at age 65 in the bottom half of earnings rose from 79.8 years in 1977 to 81.1 years in 2006, an increase of just 1.3 years. But life expectancy at age 65 for a man in the top half of earnings rose from 80.5 years in 1977 (only 0.7 years longer than men in the lower half of the earnings distribution in that year) to 86.5 years in 2006, an increase of 6.0 years. People are living longer, but it is mostly only those of higher income who are enjoying this. Life expectancies have not changed much for those of low to moderate income. It would therefore be perverse to penalize those of lower income to make up for the Trust Fund shortfall, when it is the lengthening of the life spans of those of higher income which is leading to the depletion of the Trust Fund. Yet proposals to raise the retirement age, or to increase Social Security taxes on all, would charge the poor as much as the rich to make up for the Trust Fund deficit. Rather than penalize the poor, Social Security taxes should be raised on those who are better off to pay for their increasing lifetime benefits. And this is of course also precisely what one should want to do if one is concerned about inequality. The obvious solution is to broaden the tax base for the Social Security tax to include incomes now excluded – which are also incomes that accrue to the rich. First, note that the shortfall to be made up when the Social Security Trust Fund is expected to be depleted (if nothing is done) in the 2030s would require a 20% increase in revenues. That is, following a transition between now and about 2030 as the baby boomer generation retires, the long term projection is that Social Security tax and other revenues will level off at about 5% of GDP, while Social Security obligations will level off at about 6% of GDP. That is, we will need revenues to increase by about 20% to make up the shortfall, to get to 6% of GDP from 5%. (A more precise estimate, but from my blog post of a few years ago, is an increase of 19.4%). Broadening the Social Security tax base would easily provide such an amount of funding. For wages alone, there is the current ceiling of $118,500 (in 2015) on wages subject to Social Security tax. At this ceiling, only 83% of all wages paid are subject to this tax. This is down from 89% in 1980 as an increasing share of wages are being paid to the very well off (those with wages above the ceiling). If one were to tax 100% of wages rather than only the current 83%, one would in fact obtain the funds needed, as that alone would provide an increase of over 20% (100/83 = 1.205). But broadening the base should not stop at simply ensuring the taxes paying for Social Security are paid by all wage earners equally, rich and poor. There is no economic rationale why only wage income should be taxed for this purpose, and not also income from wealth. And income from wealth is primarily earned by the wealthy. Using figures from the National Income and Product (GDP) accounts, total private income (including not just wages, but also income from interest, dividends, rents, and so on, but excluding government transfers) in 2014 was 65% more than just wages alone. (Note that while these income concepts from the GDP accounts are not the same as the income concepts defined in the income tax code, they suffice for the illustrative purposes here.) A uniform tax rate of 7.5% rather than 12.4% (12.4/7.5 = 1.65), but on all forms of income and not just wage income, would thus suffice to generate the Social Security tax revenues to fund fully the Trust Fund for the foreseeable future. But one important proviso should be noted. Such tax rates (of either 12.4% on all wage income, or 7.5% on all forms of private income) would generate the revenues required to fully fund the system based on current benefit payment projections. However, with benefit payments tied to one’s history of tax payments, one would also need to change the benefit payment formulae to reflect the broader tax base. Otherwise the benefits due would also change to reflect the higher amounts paid in. Finally, as noted above, current Social Security benefit payments are low and really need to be increased. While I do not have the data and models that would be required to work out fully some specific proposal, the figures here can give us a sense of what is possible. For example, a possible balance might be to broaden the tax base to include all forms of income, but then to reduce the tax rate on this not all the way from 12.4% to 7.5%, but rather to the halfway point of 10%. But this 10% rate would then suffice to permit a one-third increase in overall benefits (10/7.5 = 1.333), which one should want also to concentrate on those of low to moderate income. The overall tax rate would be cut, but in broadening the tax base to all forms of income one could support a significant increase in benefits. Overall taxes paid would be higher (everything has to add up, of course), and while low and moderate income earners would mostly see a reduction in the taxes they owe, richer individuals would pay more. 3) Require that 401(k) plan administration fees are paid for by the entity choosing the provider: Turning from Social Security to private pension plans, where defined contribution plans (401(k) plans and similar) are now the norm, the key issue is to keep fees low. Unfortunately they are extremely high, and take away a large share of the investment returns on the funds saved. One cause of this is that the fees being received by the financial advisors are often hidden in various ways, and charged in different ways by different entities. There is no standard, and average levels are not made publicly available to provide a basis for comparison. The fees charged will also vary sharply depending on the type of investment product being used (i.e. direct equities, mutual funds of different types, insurance products including annuities, various complex products, and more). Finally, while individual fees might sometimes appear to be low, they are imposed at several layers in the investment process, and in total come to very high levels. Not surprisingly, according to one survey 93% of the respondents dramatically underestimated what their cumulative 401(k) fees will come to. Estimates for what the average fees in fact now are vary. At the base will be the fees charged by a plan administrator, chosen by the firm of the employee and responsible for the record keeping, for allocating the investments as chosen by the plan participant, and so on. These fees will vary depending on the size of the firm and the deal negotiated on behalf of the employee, but one set of estimates are that these fees average 0.5% of plan assets annually in large firms (plan sizes of $100 million or more), 0.9% in medium size firms (plan assets of $10 million to $100 million) and 1.4% in small firms (plan assets of less than $10 million). On top of these base administrative fees one will then have to pay the fees charged by the investment vehicles themselves. Mutual funds are perhaps most common, and the expense fees on these (normally subtracted from the investment returns, so the amount being paid will not be obvious) average about 1.1%. But they can range widely, from less than 0.1% for standard index funds, to over 2%. On top of this, one has the cost of buying and selling the investments (whether mutual funds or equities or the other products), which some estimate may average 1.0%. But these too can vary widely. Finally, one may have individual fees on top of these all, which depend on the services being requested (whether investment advice, or entry and exit fees, or loan advances against balances in the worker’s pension accounts, and more). These will vary widely, but one estimate is that the median might be an annual cost of about 0.7% of assets. The total amount lost in fees each year can therefore easily be in the range of 2 to 3% of assets, and 2.5% is a commonly taken average. Note also that these fees (or at least most of them) will be taken by the financial managers regardless of whether the investments perform well in any given year. Over time, these fees will take for the financial administrators a large share of the investment returns that were intended for worker retirement. A simple spreadsheet calculation, for example, will show that over a 40 year time horizon, where (for simplicity) equal amounts are set aside each year for retirement, with an assumed 5% real rate of return but financial fees of 2.5% a year, the financial cost will have taken away by the 40th year 45% of what would otherwise be the balance saved. (It will not equal 50% because of the way compounding works.) This is 90 times the total fees that would be charged by Social Security for the old-age support it provides, which as noted above is only 0.5% of benefits paid out. Note that I am not arguing that the private fees should be the same as what the cost is for Social Security to administer the accounts. Social Security is an extremely efficient system. The specific share taken by financial fees will also depend, of course, on what is assumed for the rate of return and other parameters. But anything like 90 times as much is a lot. Furthermore, many of the fees being charged on the private pension accounts will continue into the retirement years, so the final amount paid out in benefits will be even less. Assuming there will be 20 years of retirement following the 40 years of work, with returns and fees continuing as before, the annual amount that could be paid out to the worker in retirement will be only 44% of what would be paid out if the fees were at the 0.5% (of benefits only) of Social Security, a reduction of 56%! Fees are therefore hugely important, but the worker can manage (through the decisions they make) only some of them. In particular, the basic plan administration fees for managing the accounts are made at the firm level. When firms had defined benefit pension plans, these costs were included in what the firm covered. They kept track of, or contracted out to some specialist, the individual payment obligations and other bookkeeping. But when firms switched to defined contribution schemes, most commonly 401(k)s, the firms chose to incorporate the costs of the plan administration into charges against the individual account balances, thus shifting these on to the workers. But the workers had no choice between plan administrators: They were chosen by the firm. And with the firm not bearing the cost, the firm might not worry so much about what the cost was. Rather, they might choose a plan administrator based on how good they were at making sales pitches, or whether they did other work for the firm where they might extend a discount, or based on who provided the fanciest annual conferences for their clients (the decision maker in the firm) at some resort in Hawaii. Some firms of course make a sincere effort to choose the best balance between plan administrator cost and performance, but others do not. But to resolve this, a simple reform would be to require that firms pay the cost of plan administration directly from the firm’s accounts, and not out of the pension savings of the workers. This would return to what had normally been done with the traditional defined contribution pension plans, where firms had an incentive to ensure plan administration costs were kept low. 4) Require low cost investment options be included in 401(k) and similar schemes: One can also keep financial fees down by investing in low cost investment options, such as simple and standard index funds. The Vanguard S&P 500 Index Fund, and now even the Vanguard Total Stock Market Index Fund, each charge an annual expense fee of just 0.05%. This is far below the 1 to 2% charged by most managed mutual funds. Such low cost options are included in many 401(k) plans, but unfortunately not all. Such options should be required in all. 5) Provide an option of investing in “Social Security Supplemental Accounts”: One very low cost investment option would be to invest a portion of one’s 401(k), IRA, and similar balances, into a supplemental account managed by Social Security, which would then be paid out along with one’s regular Social Security checks. Accounts would earn a return equal to the long-term US Treasury bond rate, the same as existing Social Security balances do now. The option would take advantage of the extremely high efficiency of the Social Security Administration. With the far lower cost of Social Security relative to what private financial institutions in the US charge, the net return on such investments would be attractive. Given historical long term bond interest rates and the differences in fees, the returns would be comparable to what might be earned in pure equity investments, but far less volatile. And the returns would be far better than what on average has been earned in actual 401(k) and IRA accounts, given how they have historically been managed. The Social Security Supplemental Account would be purely voluntary. No one would be forced to put a share of their 401(k) or IRA assets into them. But this would be an attractive option for at least a share of the plan assets, earning a comparable return (after fees) but with far less risk. It would be especially attractive to middle class families who may have significant but not huge assets in their retirement accounts, who are seeking to ensure a safe retirement. The returns to economic growth have become horribly skewed since Reagan took office, but there is much that could be done to address it. This blog post has discussed a number of actions that could be taken, and if the Republican (and Democratic) candidates are truly concerned about the direction of income inequality, there is no shortage of measures to consider. And this is not an all or nothing set of actions: While complementary and mutually reinforcing, taking some actions is better than none, and more is better than some. Nor are they in general administratively difficult to do. Most are straightforward. But action is clearly needed. This entry was posted in Distribution of Income, Fiscal Issues, Health Reform and tagged employee compensation, entitlements, fiscal rules, government spending, health reform, income distribution, infrastructure, job creation, pensions, policy, poverty, Social Security, tax system by aneconomicsense. Bookmark the permalink.